I recognised the Great Britain of the Olympic opening ceremony in a way I hadn’t expected. I recognised a country I live in and I loved feeling proud of that country. I don’t think that has ever happened to me before, certainly not on a National Occasion, though once, returning to England after a month in the Cyclades, I was moved to tears by the greenness of England. I don’t remember exactly when Frank Cottrell Boyce told me he was working on the Olympics’ Opening Ceremony as the writer on Danny Boyle’s creative team, only that it was on a train from Chester to London, not my usual route, and that he got on at Crewe, not his usual starting place, and that we met in one of those between-compartment-spaces as we both searched for somewhere pick up signal on the notoriously poor-coverage Crewe-Stafford section of the track. I’m not much of a sports fan and to me the Olympics meant little more than a couple of weeks of reduced eye-contact and increased grunting from the males of my family. So I was glad for Frank, but not very excited by his news, and neither could I imagine what it meant for him as a writer – I mean, how do you write a ceremony? I imagined troops of synchronised twirlers with ribbons ( I stopped watching those ceremonies round about Tokyo). Last time we met – which must have been at the inauguration dinner for his Professorship of Reading at Liverpool Hope University, he said something like, ‘It’s all books.’ I imagined giant books opening but it didn’t seem Olympic so I filed the comment away and we continued our talked about developing reading for pleasure in schools….and I sat down to watch the opening ceremony last night feeling curious but expecting boredom or disappointment. I have no patriotism bone, or I live in another country or in my own head, and I don’t like formal shows. They ain’t natural. Frank, on the other hand, is natural. He’s also a great writer. I first met Frank when we chose his novel, Millions, as our Liverpool Reads book in 2005. I’d read the novel, in the lovely original hardback edition with the golden cover, with my son Ben, the summer he left school. At 18, anyone might have thought he was a little old for Millions, but no – and neither was I – we started reading it aloud to each other on the motorail train down to the South of France and had to strictly ration ourselves to a chapter a day. It is a wonderful book, profound and ordinary and funny, which is what Frank is absolutely brilliant at. Profound, ordinary and funny and utterly believing. And there’s the rub. It was what comes from that – from believing – that gave this ceremony/performance the funny, generous, small-scale, magnificent feeling that I recognised as my country. It was knowing and witty but it was never cynical or merely clever. In his address, as the ceremony got underway, Danny Boyle said what might have seemed to some a strange thing; ‘I don’t believe in God but I believe in the people who do – this is their show, they really are the best of us.’ I thought of Frank when I read those words in the paper this morning, because all Frank’s work is about believing. In Millions, the power of belief actually changes actual reality. I should have realised, when Frank kept keeping his mouth shut on all those trains, that he and the rest of the creative team would be cooking up something massively imaginative for everyone. He did tell me it was going to be massive but I was still thinking ordinary Olympic ceremonies, the unreal worldly realism of ribbon twirling and uniformed masses marching in time. I should have known there would be none of that. Drumming in time, yes. Dancing, yes. Fond history including Votes for Women (and I was glad to read this morning that at this Games, for the first time ever, all participating countries are fielding women athletes) and believing music, Jerusalem and Nimrod and a wonderfully powerful and very quiet Abide With Me, yes. What we got was music, poetry, story and belief. I loved the sight of 300 apparently sick children jumping joyfully on beds. I loved the twee pastoral scenes with real sheep and geese and those magnificent carthorses, crazy Glastonbury Tor and the lovely English Oak atop it. I was hugely moved by the raising of the industrial northern chimneys, my chimneys, for I lived in Hyde, Lancashire as a child, and remembered skylines full of those great belchers. I loved the factory-hands, the huge numbers of individuals moving only more or less together, and who were allowed to be individuals, even in the mechanised industrial revolution scenes. I loved the hammering Pandemonium of Paradise Lost, the Blakean furnaces heating up the molten metal into heavenly golden rings. Above all I loved that it was a literary ceremony! It was all about books! The Olympic cauldron was out of Dante’s Paradiso, surely? the whole of everything comes together in one enormous flower-like fire? I prefer the C.H. Sission translation, published by Oxford University Press in the World’s Classics series. Perhaps most of all I loved the appearance of Sir Tim Berners-Lee, with the message ‘This is for everyone’ in lights behind him. Why did I find that so hugely moving? The decision to let the future, represented by those 7 apparently anonymous young athletes, light the fire in the Olympic cauldron avoided a single celebrity handover, and cleverly prevented splitting the nation into Beckhamites and Redgravites, but will also have been an image of the collaborative creative process in which Frank, Danny and their colleagues have been engaged. I remember seeing the pair of them on stage at a filmfest, discussing the making of Millions before a screening of the film. Any advice for young film-makers, someone in the audience asked. Yes, said Danny: pick your team, get a band together, have good mates. ‘And in the end, the love you take, is equal to the love you make’ sang Sir Paul, the lyrics totally overcoming my mild irritation that such a hammy old trouper should be closing the show. It was a like the perfectly positioned quotation that sets a tone around everything else that has been written. 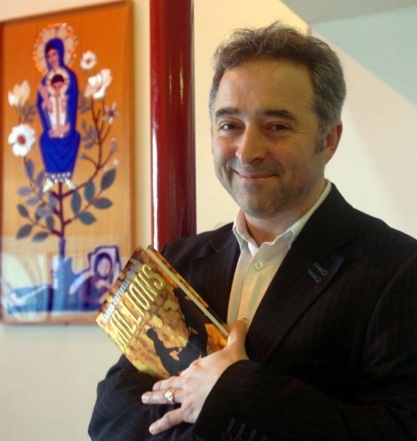 Love and belief, belief and love, with Frank Cottrell Boyce at the writer’s keyboard, of course they were the key words. The show made me glad to be British – a phrase I never thought to use. Thanks, Frank. Yes, I felt this way too on Friday night. Rather to my surprise I was entirely caught up in the drama of the show. Thanks you for expressing this so well.